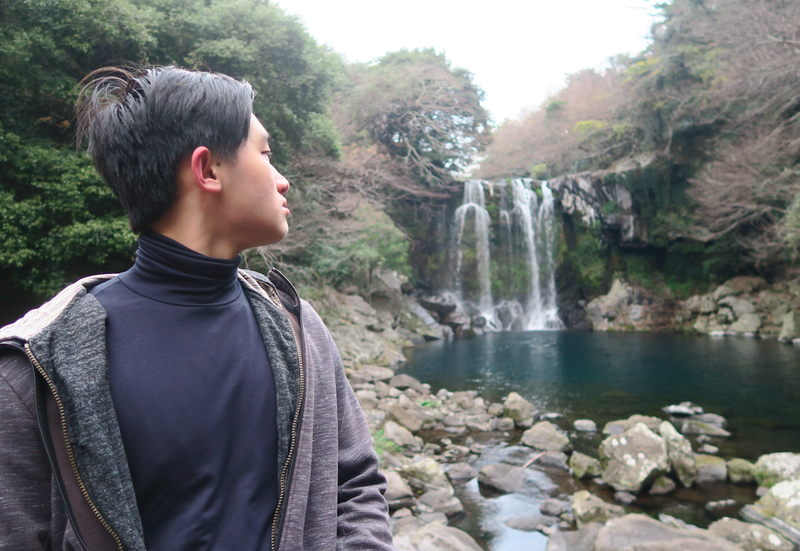 For as long as I remember, Jeju island did not make it into my travel bucket list, for whatever reason I might have. But a week before entering 2019, a wild idea stroked me: I have to escape in the name of a spontaneous trip, anywhere as long as I can be on a plane (well don’t ask me since when I’ve developed this love for flying). I browsed on the AirAsia website and immediately locked my eyes on Jeju. Not only because the fare was quite reasonable but also, I simply have to end my “prejudice” towards Korea. and so, I’ve booked the ticket almost instantly, packed my bags and fervently pray for 4 days to pass by in a blink of an eye. Next, I’ll have 5 days in Jeju Island! How exciting! We took a direct flight from Kuala Lumpur to Jeju via AirAsia X. For our Malaysian readers, I highly recommend this flight if you’re not heading to other parts of South Korea during your trip as you don’t have to go through the hassle of transits through Seoul. Disclosing my Jeju Island 5 days itinerary in 5, 4, 3, 2, 1! Yongduam, a dragon head shaped rock that was created by strong winds and waves over thousands of years despite several local legends claimed it was indeed a real-life dragon which was shot down for stealing a precious jade from the Hallasan deity. 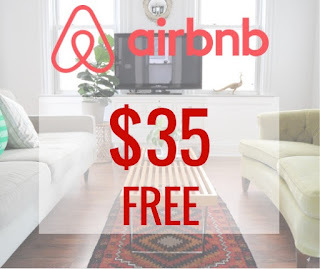 There are not much to do here but it is situated just a few minutes ride away from the airport, so it makes a good convenient start of our journey! After a quick visit to the Yongduam Rock, we hoped on bus 201 and went with the “flow”, literally. Everything on our list today can be easily reached by the coastal bus 201. 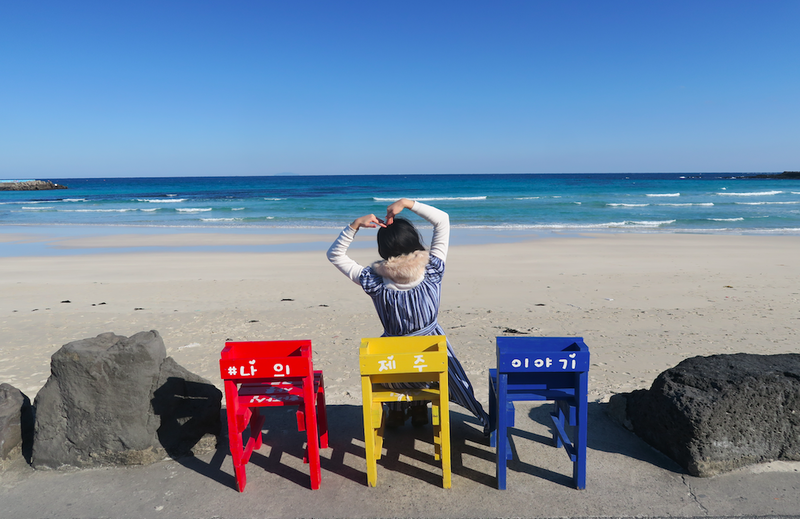 Just 15 kilometers east from Jeju city, is the stunning Hamdeok Beach, featuring, black basalt stones, white sand, crystal clear water, and instagrammable cafe, making it a popular destination for cafe hoppers. 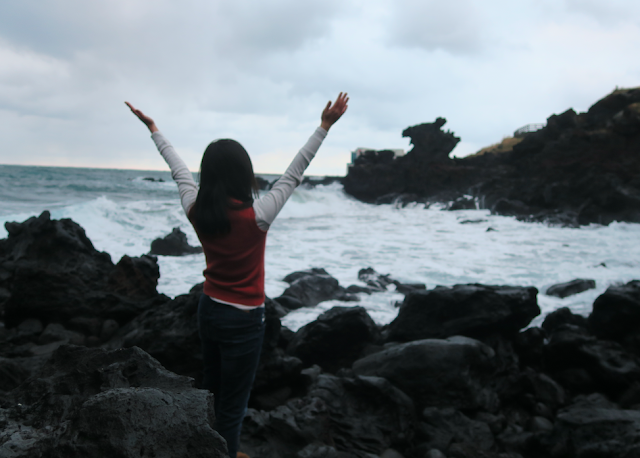 Honestly, this is the beach that I’ve adored the most on this 5-day-trip in Jeju. Not only due to its tranquil white sand and emerald ocean view, it has cute instagramable corners installed here and there… among these, colorful wooden chairs, some tiny windmills, a retro wall featuring a huge window looking out to the sea and last but not least, a whole stretch of cozy, highly instagrammable cafes aligning the beach! Just a short bus ride away from Hamden Beach on the same bus 201 is Manjanggul. I guess if you are a Malaysian and have been to Gua Nia no other caves can really impress you much. But, this cave is not like the ones we are used to, for it is created by lava from a volcanic eruption, something Malaysians aren’t familiar with, thus, something interesting. and besides, since you are already in Jeju anyway, you have to see this for it is a UNESCO World Heritage Site (since 2007). 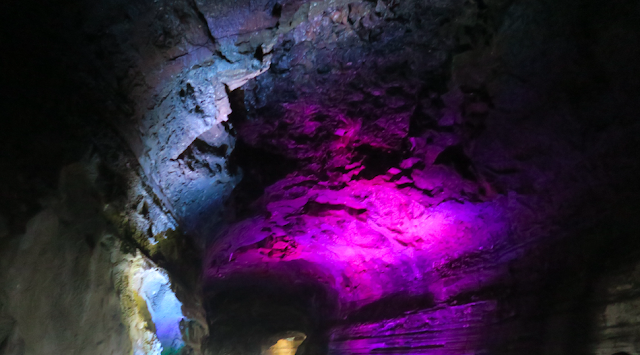 Said to be one of the most spectacular and the world largest known lava tubes in the world, here the odd structures created by lava ages ago are illuminated by ever-changing colorful lights, making it interesting to walk through the dim cavern. How huge exactly is the cave? 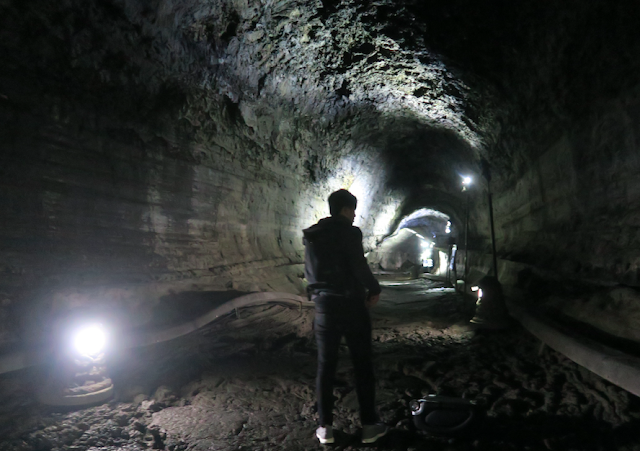 It is around 5 meters wide, and 13 000 meters in length, comprised of an intricate network of winding narrow lava tunnels and lava shelves.…. but don’t worry, you won’t have to walk that distance. there is a paved path and raised platform about 1 km to walk on (2 km round trip), at the end of the walk is the world’s largest lava column. 1. I have to warn you that the path is still quite uneven and craggy although some restoration work had been done, so take care not to stub a toe and most importantly, wear comfortable shoes! 2. Do note that the bus will only stop at the intersection of Manjanggul. to get to Manjanggul cave from the bus stop, it takes another 20-minute walk. luckily, there is also a shutter bus that will go to the entrance of the cave as its last stop. if you don’t wish to wait, you can get a taxi using the kakao app, or simply, skip it altogether. Not for Muslim travelers, but if your religion allows and you are in for Jeju’s regional delicacies, a black pork bbq is something not to be missed. Black Pig is a domestic breed in Jeju. 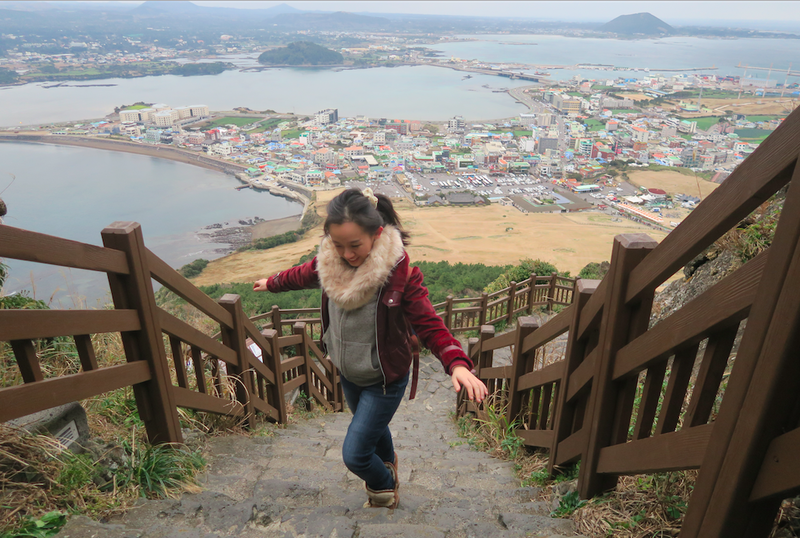 The number one in the “top things to do” list of Jeju island, is a hike up to Seongsan Ilchulbong, literally can be translated into “sunrise peak”. As the name had suggested, it is the place where Koreans come for the best sunrise. And yeah, inevitably, we have to witness the first sunrise of the year here! The formation of the sunrise peak itself is an inspiration. this world wonder of nature rose from the seabed during a volcanic eruption many years ago, and it went up to 182 meters above sea level, holding up a huge crater at the top, resembling a giant bowl.. The hike up is paved, pretty easy so you can reach the top platform under 20 minutes where you can look into the crater. There are a lot of steps at the top platform to sit on and simply relax and take in the view. Some say, on a good day, you can even see dolphins and whales from there. I read online that the entrance fee is supposed to be 2000 Won, however, there is no one there to collect payment so I supposed it was free for new year celebration? Who knows. Jeju itself is an island, but do you know there are about 30 tiny islands surrounding it? Udo island is just a 15-minute ferry ride away from Seongsan port, making it a perfect day trip destination after a spectacular sunrise experience at Seongsan Ilculbong. although I myself did not manage to put both plans in a single day, I highly encourage you to do so, simply because of their proximity. the origin of its name “Udo” was inspired by the shape of the island, which is said to resemble a cow lying down. however, honestly speaking, I couldn’t see how it resembles a cow… Well maybe the shape changes throughout the years. Udo is a laid-back island, where the perfect way to spend a day, is to rent a bike, ride along the coastal road surrounding the island and eat your way around. Ferry leaves every half an hour from 7.30am till 5 during winter or 6 pm in other seasons. In order to buy the ferry ticket, You’ll have to fill up 2 copies of the declaration form. present the forms along with your passports to the person at the ticket counter, then only your purchase will be successful. I’ve seen people got turned away at the counter for they forgot to bring their passport. don’t make that mistake. 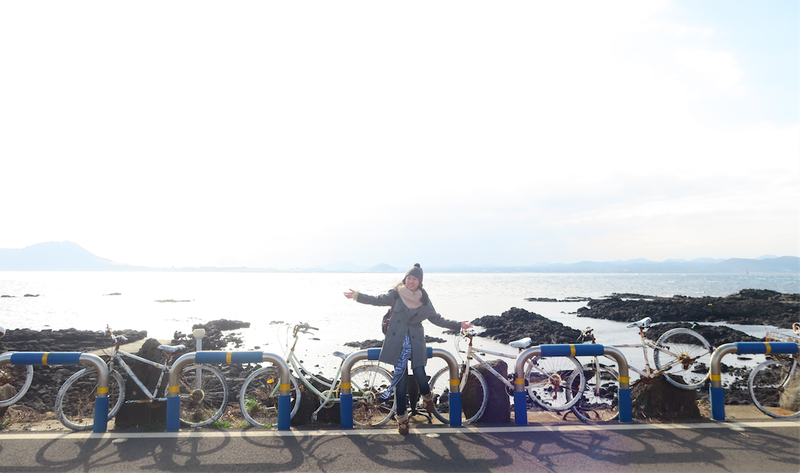 We spent half a day getting around the island by bike (we rented a regular bike, 10000 krw a day). However, I am going to be bloody honest here, this decision nearly cost my life! Although most of the coastal road looks flat, they are actually slight slopes, which means more exercises. If you are a tofu or you seldom work out, then this day will become your leg day and the seemingly harmless “flat ground” will rip your legs apart. So, be real to yourself, take an electric bike that will cost slightly more but you’ll get to keep your legs. Alternatively, rent a scooter of a tuktuk, however, you’ll need an international driving license for that. Most countries in the world aren’t that fussy when it comes to international driving license, but not in Korea, where strict laws on road safety are enforced. Well, I know some of you don’t cycle nor drive. Don’t worry, you can still enjoy Udo via the Tourist Shuttle Bus! People on Udo island take pride in their main agricultural product — peanuts! There is even a saying that if you’ve never tasted Udo’s peanuts, you’ve never been to Udo. The most popular way to sample this local specialty is through Udo’s famous peanut-flavored desserts, especially peanut ice cream! Of course, there are also peanut bread and peanut lattes around but not as instaggramable as a creative peanut ice cream! Here we have seen some Hanyeo in action. 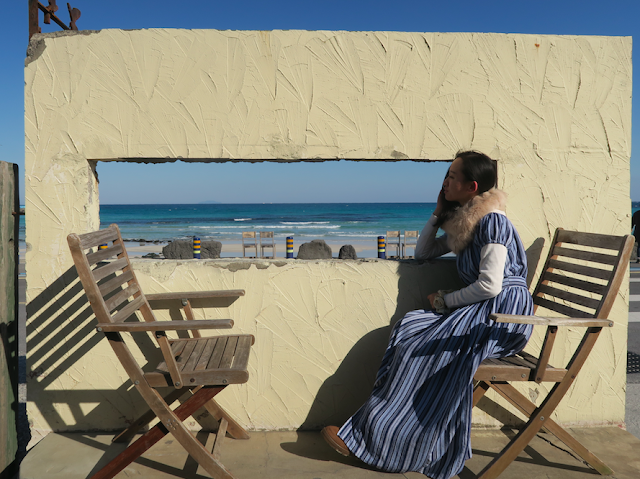 Hanyeo can be translated to sea-women literally, and the name gave away how they support their families— by collecting sea cucumber, shellfish, fishes, seaweed and abalone. Here women varying in age deep sea diving to the depth of ocean floor with merely a pair of goggles and wet suits, without oxygen supply or any other diving equipment. Some of them are so well trained, they can stay underwater for 10 minutes straight, making them real mermaids. being a hanyeo is extreme hard work, but believe it or not, this profession is dominated by the older generations with the majority of them being older than 60, since the youngsters aren’t willing to take up this job…. haenyeos are getting extinct, it is a profession you can never find in other parts of the world. In Seongsan area we saw quite some humble stalls and restaurants run by Hanyeo. however, I did not try them coz i am not a big fan of shellfish, well perhaps next time when I am really hungry. What we did tried was a special cheesy fried rice called Hallasan rice in Udo, alongside with their famous seafood mix pot. Satisfying! 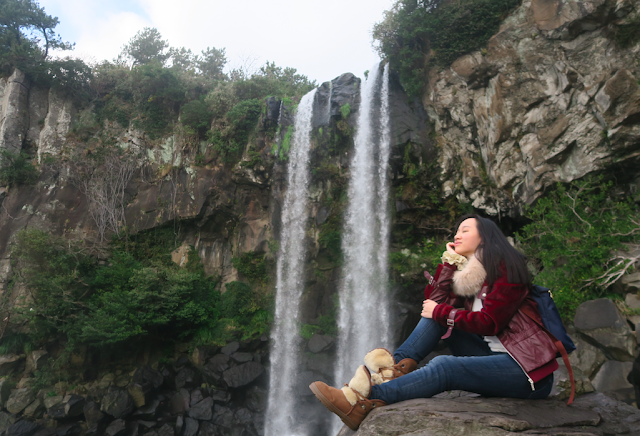 If you only have time to see one waterfall in Jeju, it has to be this one. Being the only falls in Asia that plunges directly into the ocean, Jeongbang is a must visit in Jeju island especially popular during the summer time. JeongBang means the “first wife”, well I do not know why on earth the waterfalls were named that way but I got my heart shattered underneath when I saw the photo of my (now ex) boyfriend hugging another girl here. Huge betrayal and such irony. Well anyway, he doesn’t deserve me (sorry for the rant but I guess I just have this urge to tell you the backstory, for you all are the ones that matter now.) Well stories aside, best waterfall on the island, I saw it at least! Korean legend tells a story of a holy dragon living underneath the falls, would you dive in to meet this dragon? This waterfall is special. Why? Because within a small area of the fall, we can find several national monuments. Let me explain one by one. First and foremost, Cheonjiyeon Falls, has an interesting name. "Cheon" in Korean means heaven/sky and "Ji" means land. It literally bears the meaning " The water that falls from the heavens to our land". Falling from a height of 22 meter, Cheonjiyeon fall plunges into a 12m wide and 20m deep water which is designated as Natural Monument No. 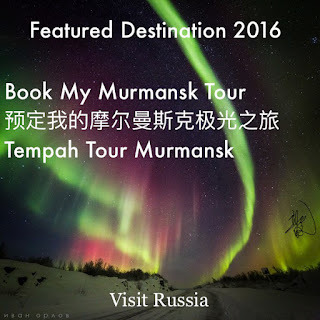 27 and is renowned as a habitat for Mutae eels (Natural Monument No. 258). Not only that, the wild Dampalsu trees surrounding it are designated as Natural Monument No. 163. And the whole forest made up of various flora and fauna including rare plants such as brambles, Songyeopnan and Gusiljappam trees, is specified as Natural Monument No. 379. I think this is an essential stop of Korean Drama fans. Oedolgae Rock is an amazing rock measuring 10 meters in circumference and 20 meters in height that stands alone surrounded by beautiful sea water. It is also known as The Lonely Rock/ Janggunseok Rock. The reason why Oedolgae is so famous, is for the 2003 TV hit drama series, "Daejangguem". If you still couldn't recall, it is where Hansangoong (Yang Mi-Kyung) faced her death under a false accusation while being carried on Daejanggeum's (Lee Young-Ae) back. If you have the time to walk until the end of the trail, you will see a billboard of the drama and a cut out real-life Daejanggeum. Jusangjeolli — A dramatic 2km stretch of neat interlocking Basalt Columns along the sea coast just south of Jeju International Convention Center and a sprawling pine forest. 🌊Also the result of ancient Volcanic Eruption (Hallasan) 🌋, this is the South Korean own Giant Causeway, well now I don’t have to fly all the way to Ireland for the Games of Throne vibe! There are not too much to see here, unlike the giant causeway, yu can’t step onto the basalt column, and the nearest you can get is on the raised platform, which takes away all the adventures… well, you know I am not such a big fan of boring experiences so yeah this place doesn't give me much thrill. 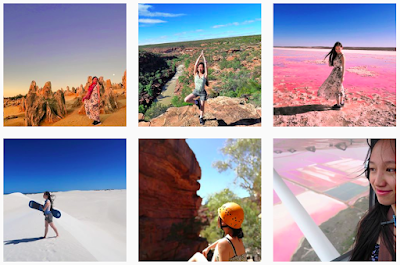 Nevertheless, come for an Instagram picture and check in. Combine your visit with Cheonjeyeon and the indoor attractions like teddy bear museum and the Playkpop. They are just a short bus 🚌 ride away. Or you may walk like I did, about 30 minutes. There is not only 1 but 3 falls all together. The “Cheonjeyeon” fall, which is the first tier is the least impressive of all so I guess if you are running out of time feel free to skip it. the second tier, in my opinion, is the most beautiful. The third tier is a little distance away from the first two, but it is in my opinion, worth the exercise. Legends had it that there were seven nymphs that bathe in its waters so it is also named the “Pond of gods”. you’ll walk over the seven nymphs bridge to reach the falls. hah! 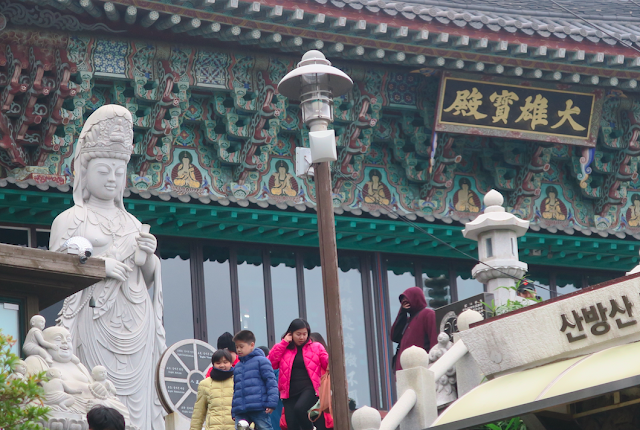 I did not visit any indoor attractions on this trip, but my family had been there and loved the experience. Well, if you have time and the money to spend, why not? The most expensive teddy bear worth $2.1 million, well that could be the main reason for you to visit it (if you ever need one to convince your uninterested partner)! However, if you’ve missed the teddy bear museum in Jeju and later on regretted it, don’t be despair, as the teddy bear museum is branch museum which you can find all over Korea, including Gyeongju and Seoul. Get a mini workout and hike up this mountain. There’s a temple on top and some pretty sweet views. Situated on the Yongmeori coast, Sanbangsan Mountain offers unparalleled views across Jeju with sprawling hills and impeccable nature for as far as the eye can see. The ascent to the peak of Sanbangsan and the temple that awaits you at the top is not too challenging, provided that you are in generally good physical health. Walking the length of the coastline in Yongmeori that encompasses Sanbangsan is also incredibly peaceful. It leads you along the sea coast, past jagged cliffs, and through lush green fields. There are several watchtowers scattered along the route here to look out for which acted as vantage points during the Korean War. If I am not a “selfless” travel blogger as I am now (well, I still keep secrets but anyway I consider myself honest enough ) and you ask me what is the best thing about Jeju, I will not tell you about Yongmeori, coz I want to keep this heaven all to myself! Hallasan is the pride of Jeju: a beautiful dormant volcano sitting right in the middle of the island that helps created Jeju’s most impressive landscapes… looking at all the natural wonders on the island, I realize almost all of them have a history directly or indirectly related to Hallasan! I think you can consider this a statement: Hallasan is the mother of Jeju, without it, the island won’t come to existence. No wonder it is considered as a UNESCO heritage. Today is suppose to be our Hallasan Day but oh, unfortunately, it was snowing so badly on top of the mountain hence the bus to Yeongsil stopped running! We were very sad and I guess it was written all over our face when a bus driver told us that he is driving to Soegwipo passing by Seogpanak trailhead, so he could drop us there instead. When we asked about the fare, guess what, it is a token of hospitality for 2 foreign tourists, so kind of them! We were so keen to hike the mountain, we actually checked a few times and waited under the mountain, for a slight chance of weather clearing up and the authorities might open up the trail again. but that didn’t happen. So instead, we just play snow fight and build a snowman with our new friends from China (we met them at the foot of Hallasan Mountain, that must be fate). Well, Hallasan looks absolutely gorgeous so I’ll definitely be back one time to hike it, preferably during spring or autumn! Note: there are 6 different trails to access this beauty, but only 2 trails will bring you to the peak of the mountain: Gwaneumsa and Seongpanak. O’Sulloc Green Tea Museum, as the first tea museum in Korea, is a must visit in Jeju. It boasts the largest tea plantation in South Korea, so after your information visit about Korean tea culture and history in the museum, cross the road right in front of it and start spamming your Instagram feed in the tea plantation. If you walk through the little jungle trail behind the cafe section of Osulloc, you will reach Innisfree. 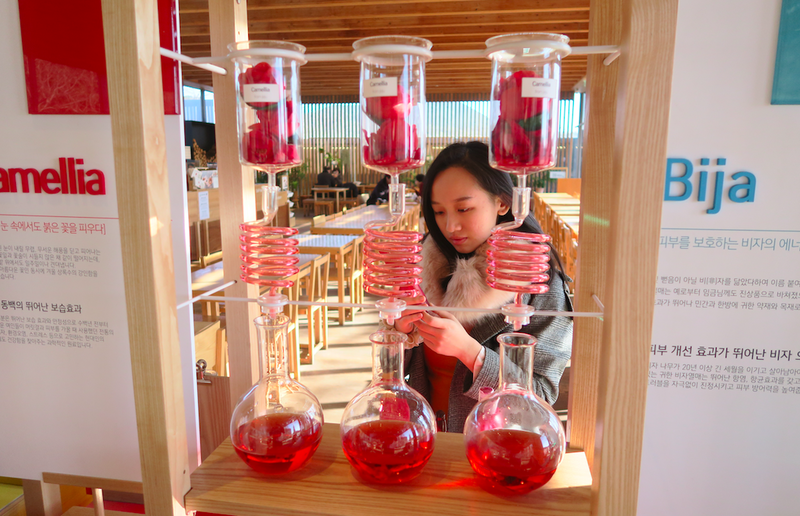 A world-renowned cosmetics brand house where visitors are free to experience everything from soap making to food sampling. Lunch box sold here were made with high-quality local ingredients apart from being very bloody instagrammable… well, you will understand what I mean when you see the Hallasan cake for yourself. So, trust my judgment when I say: Keep your stomach for a scrumptious lunch here, please. 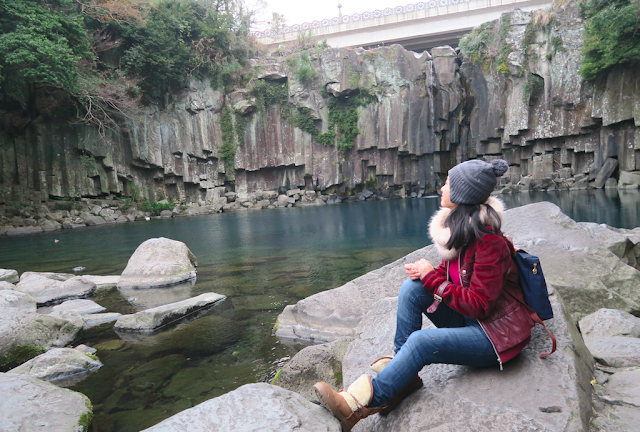 There is a secret garden on Jeju Island that does not play by the winter rules. 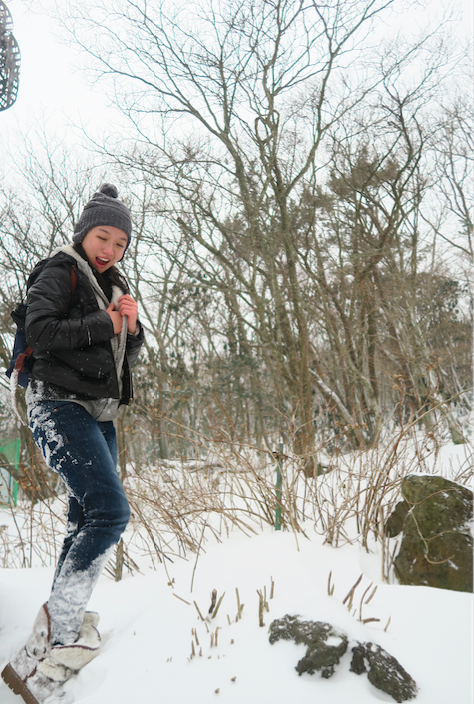 Camellia Hill is the place You can enjoy Spring like Its no one else’s business amidst the cold weather. The best time to visit is from December to January when the Camellia flowers are in full bloom. 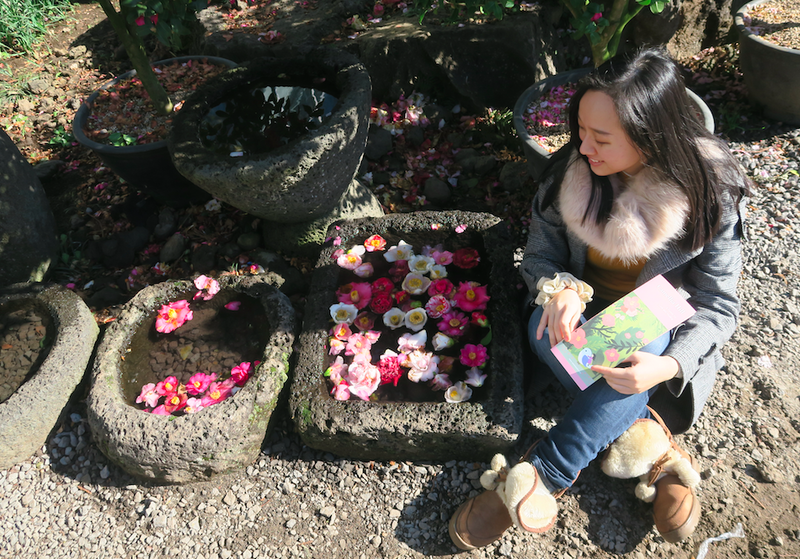 Today, I’ve finally visited Jeju’s most romantic site, The Camellia Hill. And, do you know that every flower has its own unique signature meaning? Camellia means “I Love Only You”. Have more time to kill? I guess if you are visiting Jeju with your loved ones, Loveland could spice thing up for you. This aquarium in Jeju is the biggest in East Asia featuring more than 5000 ocean creatures from all over the world. The special diver program is what makes a name for Hanwha Aqua Planet. The Mysterious Road gets its name due to the optical illusion. Although it actually is a downhill slope, it looks like an uphill road. So objects seem to be rolling uphill. 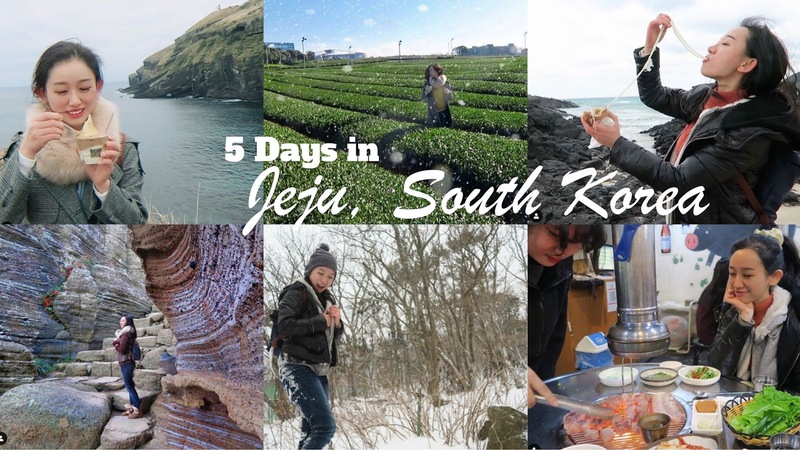 So this is how i spent my 5 days in Jeju Island, South Korea and now you have my itinerary as a reference! Since my return from Jeju Island, I’ve been trying to persuade all my friends to visit this gem. Before my visit, I’ve never imagined the rolling landscape, beautiful nature, idyllic drama settings, and most importantly delicious food. Now I finally understand why some Koreans refer to the island as Korean Hawaii… well, because it truly is! In fact, Jeju island is one of the most popular holiday destinations among locals, especially for honeymoons. I’ll never get tired of their gushing waterfalls and paradisiacal beaches… so high chance that I’ll set foot here again. Who’s with me? 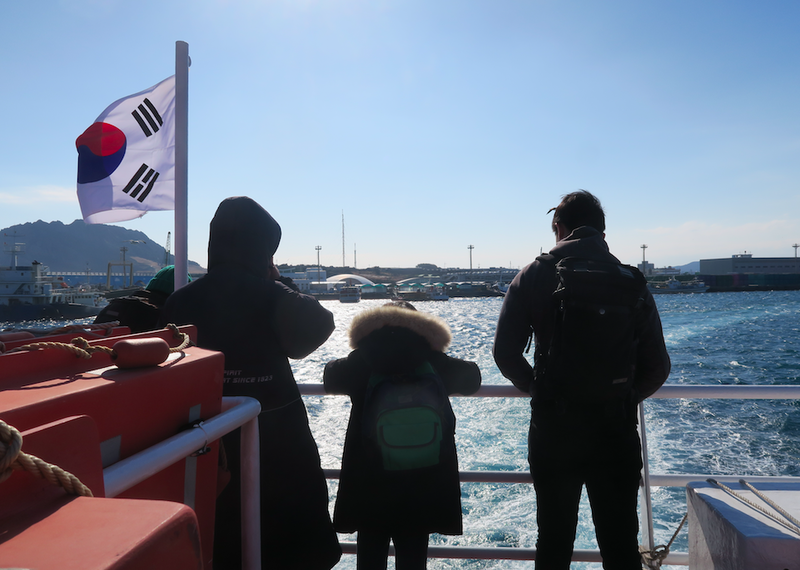 Although I am pretty satisfied with my bus trip around Jeju Island, an even more fun way to do it is to rent a car with a bunch for friends and explore Jeju on your own pace! Yes, this is a perfect place to organize a road-trip!